The edit-a-thon will begin with our free tutorial led by Simranpreet Anand on April 27th at 12pm. Participants will learn how to begin their research, edit and create Wikipedia pages, and keep them online. 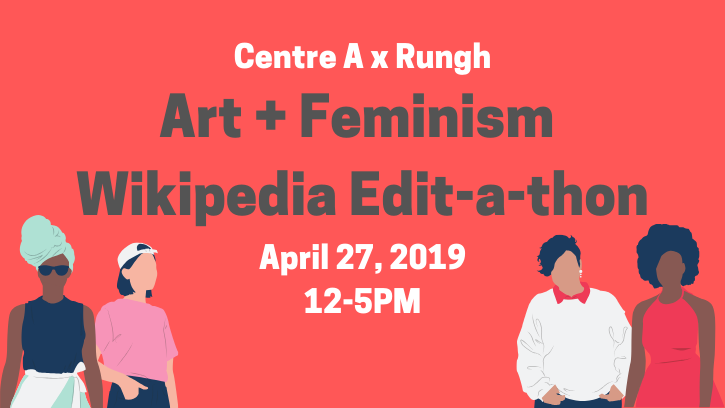 Art+Feminism’s Edit-a-thons and other initiatives make an impact on the gender gap through crucial improvements to gender, feminism, and art related subjects on Wikipedia. Since 2014, Art+Feminism edit-a-thons have taken place across the world, creating and improving over 11,000 articles. – We will also have a list of suggested topics but participants are welcome to bring their own ideas for entries! People of all gender identities and expressions are invited to participate in making an impact on women, gender, feminism, and the arts on one of the world’s most popular sites. Please bring a laptop and power cord to the event. The event is free and open to the public, please RSVP if you can to help us with our catering count or, if you find yourself in the neighbourhood, drop in! Childcare: If you require childcare, please contact Diane at info@centrea.org by 12pm, April 25, 2019, or call (604) 683-8326. Mobility: The gallery is wheelchair friendly. If you have specific accessibility needs, please contact us at (604) 683-8326. *Please Note: This event is jointly hosted by Centre A and Rungh, and registration information will be shared by both organizations. © 2019 Centre A. All Rights Reserved.